Maximum image width (horizontal) is 1400 pixels. Maximum image height (vertical) is 1050 pixels.Smaller images are acceptable. Please keep compressed file size to no more than 1MG and a maximum image quality of 12. Even with a maximum image size 1MG. Please adjust the image size accordingly. The judging panels for the 26th annual Georgia Southern Circuit. You will note that our judges have on average 7 years of experience working as a judge at the GASO, and we try and not use these same people at the NORGA ,and never at the DIGA Circuit in the fall of each year. During the 2016 judging there are 6 judges which this will be their first year with us in this capacity, but all have worked either behind the scenes at our judging, or judged in Georgia at the club level, or have been teaching photography for a good number of years. These new judges names are followed by an “N”. Our judges never “work” the incoming entries as then they might know the images to some extent! At the same time we encourage everyone associated with the Circuits of Georgia to observe as many judging cycles as is possible if the are, or were, judges, so they can see the trends in photographic works within the scope of the entrants who follow the PSA approved shows and enter their images. Our system is a bit different – There are 4 judges listed for each show, and an alternate, whose name is followed by an “A”. During the “pointing” rounds of the exhibitions 3 of the 4 listed judges give points to your images as the 4th judge ‘rests’ out that round. During, and only during the changing of the rounds of judging, will one of the 3 judges will then change positions with the ‘resting’ judge and they will sit out one round as the 3 others will point the images. Every judge “points” 3 rounds of the 4 presented images, and sits out one round. All 4 judges are active in the selection of the medals and the honorable mentions! If an alternate is needed they change between rounds – but the alternate is always in the room during the pointing cycles at all times. and Douglas Castleman “A” ”N”. the exhibition rules, conditions or definitions. 1. All entries must originate as photographs made by the entrant on photographic emulsion or acquired digitally. By submitting an entry, the entrant certifies the work as his own. The entrant permits GASO Exhibition to reproduce all or part of the entered material free of charge for publication or display in media related to the exhibition. 2. Each image must have a unique title not more than 35 characters. Words such as “Untitled” and “No Title” are not acceptable as part or all of an image’s title, nor are camera capture filenames or titles consisting of only numbers. No title or identification of the makers shall be written anywhere on the face on an image. ANY image, any duplicate of that image, or “near” dupe which was accepted in any previous GASO Exhibition must not be re-entered in any section of the same Division Star Ratings class. 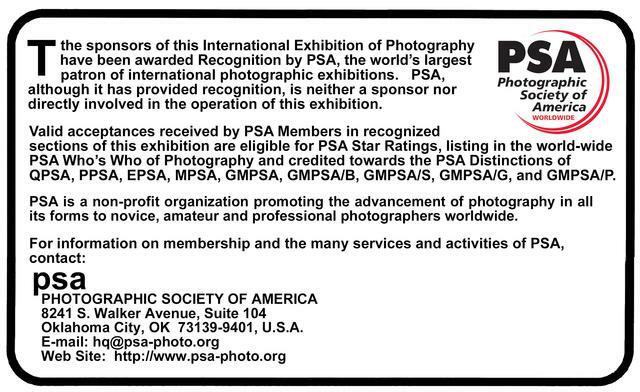 Images may not be re-titled for entry in any other PSA recognized exhibition. 3. For image display during judging we will be using 52 inch Hi Def Back Lit Television Screen. Undefined Subject Matter. Images may be altered, either digitally or otherwise, by the maker and artwork or computer graphics created by the entrant may be incorporated if the photographic content predominates. A monochrome image is defined as having varying shades of no more than one color (various shades of that color from very light to very dark) but it may be in any single color. Multi-toned images (various shades of two or more colors) and greyscale images with an added accent color are not acceptable in Monochrome Class sections and must be entered in Color Class sections. For all monochrome sections recognized by the PSA Projected Image Division. 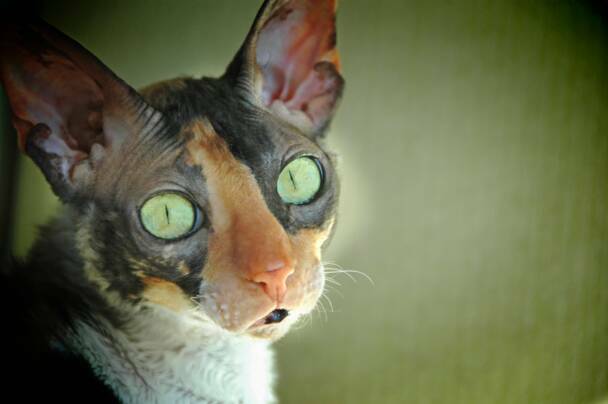 • Color images can be converted to grey-scale monochrome. Photography Definition above can have landscapes, geologic formations, weather phenomena, and extant organisms as the primary subject matter. This includes images taken with subjects in controlled conditions, such as zoos, game farms, botanical gardens, aquariums and any enclosure where the subjects are totally dependent on man for food. Must follow the PSA Photojournalism Photography division definition keeping in mind that HUMAN INTEREST must be the center of interest. If the exhibition determines AT ANY TIME before, during, or after the judging that an entrant has submitted entries where one or more images fail to comply with the Conditions of Entry, including the definitions, the exhibition reserves the right and discretion to delete the entry from the exhibition and void any or all acceptances or awards. Fees may be forfeited in these circumstances. To ensure that images comply with the Conditions of Entry and definitions, the exhibition may carry out checks on images to make sure that: a) the images are the original work of the entrant and b) the images comply with the rules and definitions as set out in these Conditions of Entry. This may involve asking the entrant to provide originally captured image(s), with EXIF data intact, by a set deadline. The questioned image(s) of any entrant failing to comply with such a request for the original image(s) may be considered in breach of these Conditions of Entry, and declined such entries may be referred to PSA for further investigation of possible ethics violations. PSA retains the right to investigate in any way all complaints/suspicions of breaches of entry conditions, impose sanctions if deemed necessary, include the entrant's name on the list of sanctions provided to Exhibitions, and share such investigations with FIAP. Entrants agree to these terms by the act of entering any of the Georgia Circuits.